Rolling into the Lookout Pass, Idaho parking lot at just past eight one Sunday morning I was startled by how few vehicles were there. 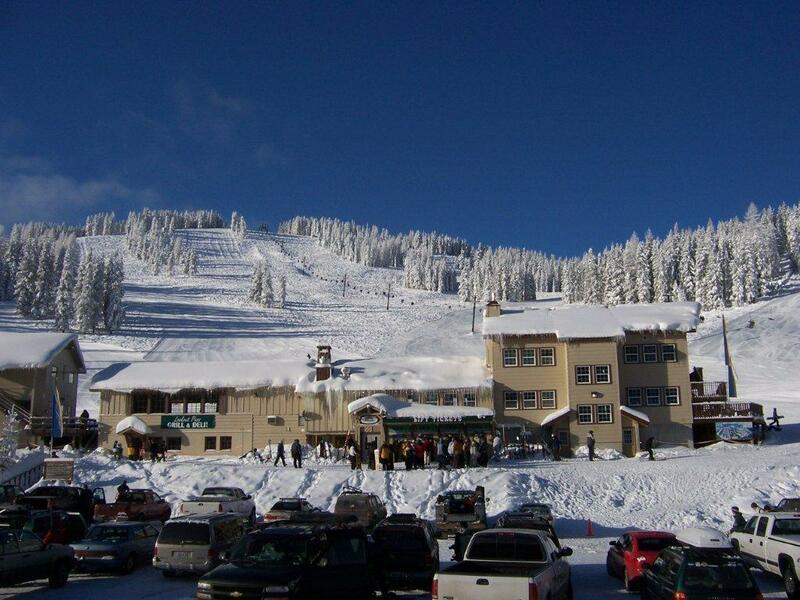 It felt as though I had traveled back in time and was arriving at Mt Spokane for a day of skiing in the late 60s. Back then Mt Spokane had just two lifts and only the original old lodge number one. I wasn’t sure what sort of experience this day was going to bring. The lift ticket I had purchased in Coeur d’Alene was only $34, about one-third of what I am accustomed to paying in Colorado. When I purchased it the vendor had apprised me that Fridays are Boomer Fridays and if you are past the age of forty you ski for $26. Now that’s got to be one of the best ski bargains in the country! My daughter was in town visiting from Colorado and wanted to try the “epic” powder she had heard so much about. And with the snow from the night before fresh on the slopes and the promise of a steady snowfall throughout the day, it appeared her wish would be granted. It’s not a large mountain with four lifts and 1,150 of vertical. The blacks felt more like un-groomed blues to me. But the snow made up for it. Over 400 inches fall in a typical year. We started the morning with eight inches of fresh powder and not many people. With the steady snowfall there was good powder the entire day without even having to seek out the trees. There was a time when I could easily ski the whole day. But that was then and this is now. As the song goes, “I’m not as good as I once was, but I’m as good once as I ever was.” That sums up the skiing experience for me at this age. By lunchtime my legs had had enough. The Loft Pub is quite the informal spot for lunch. This is a local ski mountain with no accommodations and most of the visitors are locals which adds a certain rustic atmosphere to the place. No $15 dollar slices of pizza here. They offered a bratwurst for $6 and the beer was $4 if I remember. A day of skiing for two in Colorado can easily top $300. At Lookout we spent less than $125 – my kind of place. The resort was purchased by a group of investors in 1999 and was fairly rundown at the time. They have since spent a considerable sum improving the place. The interesting part of the story is they paid less than the average sales price of a two bedroom condo selling in Vail, Colorado at that time. They bought the whole stinking resort for less than the price of a condo! And so far they have stayed true to their guests and offer a no-frills, fun filled day of skiing on terrific snow at a modest price. I hope they keep the faith, retro is good. This entry was posted in Personal Finance, Skiing and tagged lookout pass, musings, resorts, ski, vail, winter on March 15, 2014 by Terry.